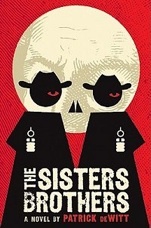 The Sister’s Brothers has a trailer. “You can have your precious honor or you can have your precious Darcy. One or the other must be set upon the pyre. Which it shall be I leave to you.” ~Lady Catherine De Bourgh. Traditionally, the hallmark of a great play is the three act structure, and every novel must have a beginning, a middle, and an end (unless you’re into crappy stream-of consciousness). However, when the material cannot be sufficiently covered over the course of a novel, writers seem drawn to the idea of a trilogy. Recently, Stieg Larsson’s Millenium Trilogy has enthralled readers, and while not originally published as a trilogy, few would think of The Lord of the Rings otherwise. 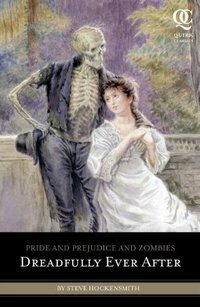 So, when Seth Grahame-Smith’s Pride and Prejudice and Zombies (apologies to Jane) took off up the charts, what better way to bookend his work than to transform it into a trilogy? The prequel, P & P & Z: Dawn of the Dreadfuls was a delightful introduction to the Bennett clan, a wittily crafted back story to the events of Pride and Prejudice and Zombies, and a nifty explanation of how things came to be the way they are in the “Z-land” that is Regency England. Or Dreadful England, whichever you prefer. And yet, one must wonder what happened to Elizabeth and Fitzwilliam Darcy after they conquered his pride and her prejudice. Did they settle down in wedded bliss, marred only by the occasional ninja attack or Dreadful invasion? Was Elizabeth able to content herself with the domestic life, forbidden from practicing her martial arts by the conventions of polite society? Well wonder no more, because the answer lies in the sequel, Pride and Prejudice and Zombies: Dreadfully Ever After. It is a time of hopeful optimism, for the Regency is to become a Monarchy again. The madness of King George III has abated, and his re-coronation is anticipated by aristocracy and peasantry alike. For Elizabeth Bennett, it should be a happy time, married to a man she loves, living a life of relative comfort…yet something is amiss. Born and bred a warrior, she finds herself unable to indulge in her necrocidal urges, restrained by the sense and sensibility that must be adhered to as the wife of a nobleman. Decapitating Dreadfuls just isn’t accepted as a skill set a married women may practice. Darcy understands her discontent, but finds himself unable to lighten the mood, and Elizabeth spends many a day roaming the moors in hopes of a lethal (not for her) encounter. Yet when that encounter comes, it is Darcy who is delivered the fatal blow, the death sentence that accompanies even the slightest nibble from the recently re-animated. Under the threat of losing the man who means everything to her, thoughts of discontent with her position in life vanish, and lead to a bargain with her personal nemesis…her aunt (through marriage), the lady Catherine De Bourgh. It is to Darcy’s fortune, but Elizabeth’s misfortune, that her oldest enemy might hold the key to his survival in the form of, if not a cure, a stopgap until one can be found. Elizabeth must swallow her pride and overcome her prejudice if she is to save her soul mate. A word about London in the time of the Dreadfuls. It is a place of walls, a fortress city, subdivided into fortified districts, tied together only by the amazing sewer system that winds its way under the city. A place of dandies and fops, Dreadful races (literally…it does not pay to be Irish unless you can outrun a zombie) and Bedlam, both literal and figurative. In this “hospital”, residing in the sinister section twelve central, is the cure they seek, and with the help of a daring plan, sisterly love and a few ninjas, they must breach its walls if there is any hope of obtaining the cure. The irony of this novel is that it is not so much the story of Elizabeth and Darcy as it is the coming of age of her younger sister Kitty, historically characterized as a boy hungry air head, and the humanization of her elder sister, the ever sanctimonious and bookish Mary. Away from the influence of the truly vacuous Lydia, Kitty is able to assert her own character, that of a young woman who looks at life in a light-hearted way, yet has an underlying sense of, well…sense. As for Mary, once parted from her precious books and challenged by a mysterious protector as she attempts (on her own) to discover the secrets of Bedlam, her sharp edges are softened (unlike her blades) and she develops a softer touch. For both Kitty and Mary, romance appears when least expected. The author also introduces a variety of antagonists for the Bennetts, from the Monty Pythonesque Angus MacFarquhar, a mirthless scientist capable of hideous depravity (and considerable racism) in his quixotic quest to cure the land of their “troubles,” to the treacherous, yet troubled Nezu, leader of Catherine Debourgh’s ninjas. And then there is the mysterious beggar in a box, an agent with an agenda of his own. What I always love about a Hockensmith novel is not so much the storylines (they are great!) but rather the approach to language. 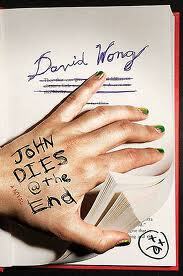 Witticisms and double entendre’s abound, and make for a smart, yet hilarious take on an otherwise somber subject. Death and mayhem are infused with a sense of both the ludicrous and hilarious, and there were many moments when I chuckled out loud at either the banter or the situations the characters find themselves in. My biggest complaint (probably the only one) is that the novel is not longer. I could have read another hundred pages of the exploits of the Bennetts before coming to the conclusion and it was with a sense of both satisfaction and regret that I finally put down the book. Like a great trilogy, it has a sense of completeness, but also leaves open the possibility of further adventures. Steve himself speculated on the subject in a nice little interview over at Daemon’s books back in April. *bloggers note: In my short time as a reviewer, I’ve discovered that advanced copies of new novels are hard to come by up here in the great white North (yes, folks, Canada). Publishing houses and promotional blogs simply won’t ship across the border, and for the life of me, I don’t know why. When he saw me moaning on the subject, Steve stepped up and sent a copy for review, for which I thank him. However, life got in the way and I have finally posted much later than expected, for which I apologize. My penance? Downloading a copy of Naughty: Nine tales of Christmas Crime, which, when I think about it, really wasn’t any sort of punishment at all. Trust me. He also maintains a blog at stevehockensmith.com that is well worth a visit.